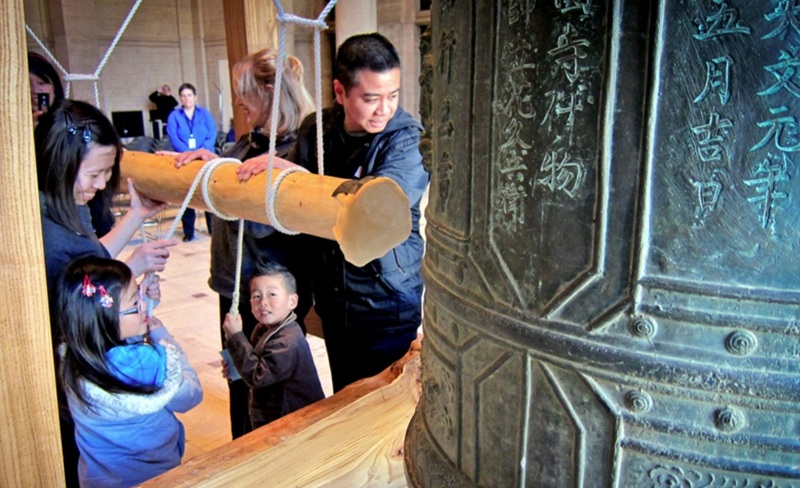 SAN FRANCISCO — Ring in the new year by taking a swing at a 2,100-pound, 16th-century Japanese temple bell on Sunday, Dec. 31, at the Asian Art Museum, 200 Larkin St. in San Francisco’s Civic Center. Led by Rev. Gengo Akiba, this inspiring ceremony, now in its 32nd year, will include a purification ritual and chanting of the Buddhist Heart Sutra. Rev. Akiba will begin the bell-ringing, and participants may then take turns ringing the bell to leave behind any unfortunate experiences, regrettable deeds or ill luck from the previous year. The bell will be struck 108 times on New Year’s Eve to usher in 2018 and curb the 108 mortal desires (bonno) that, according to Buddhist belief, torment humankind. In Japan, the ceremony is held just before midnight, but the museum event takes place in the daytime. While you wait your turn, paint a Year of the Dog charm (netsuke) and make a wish for the new year. Free with museum admission. First come, first served. Pick up tickets to ring the bell at the admissions desk. Members only: 9:30 to 11:30 a.m. General admission: 11:30 a.m. to 2 p.m. Every effort is made to allow all visitors an opportunity to participate. However, to ensure you have a chance to ring the bell, it is recommended that you arrive at Samsung Hall no later than 12 p.m.
Family Fun Day is set for Sunday, Jan. 7, from 10:30 a.m. to 2 p.m. Free admission courtesy of Target. On Family Fun Days, gallery activities, creative art projects and immersive storytelling make art appreciation into a lively, family-friendly event. Themes and projects change regularly, so visit again and again. The Jan. 7 event will celebrate the new year with festive storytelling and art-making both inside and outside of the museum. Tour for kids ages 3-6 from 10:30 to 11 a.m.; kids’ tour: 11 to 11:30 a.m.; art-making and self-guided activities: 11 a.m. to 2 p.m.; storytelling for families: 1 to 1:45 p.m.
Mochitsuki will be held on Saturday, Jan. 20. Free with museum admission. Kagami Kai will present the colorful and exciting New Year’s tradition of mochi-pounding to make delectably sweet rice cakes, with lively music, energetic dance and traditional costumes. Plus you can make folded paper cranes for luck and prosperity in the new year. Paper crane folding and omikuji from 11 a.m. to 2 p.m. in Loggia. Mochi-pounding from 12 to 1 p.m. in Samsung Hall. Regular museum hours are Tuesday through Sunday, 10 a.m. to 5 p.m.; closed Monday. For more information, call (415) 581-3500 or visit www.asianart.org.